The Theosophical Order of Service’s (TOS) Rosebud project has been giving gifts of school supplies in the Fall and warm coats and Christmas gifts in the winter to the children of the Rosebud Indian Reservation in South Dakota for more than ten years. Our longest running active program, now called the Native American project, it has expanded in recent years to include: giving refurbished computers to students, blankets to elders, computer assistance to a tribal newspaper and scholarship awards to nursing students at the Oglala Lakota College located on the Pine Ridge Reservation. This year the TOS also awarded a grant to the Lakota Waldorf School at Pine Ridge. The Pine Ridge Indian Reservation in the southwest corner of South Dakota is the home of the Lakota Sioux people. At 11,000+ square miles, Pine Ridge is larger than Delaware and Rhode Island combined. The Lakota people live within a rich spiritual and cultural heritage anchored by the four Lakota values: Generosity, Courage, Respect and Wisdom. Lakota tradition places an emphasis on home and an extended concept of family, and spirituality plays a role in every action. It is these values and the traditional Lakota world view combined with the Waldorf model of education that appealed to us as theosophists. Conditions on Pine Ridge are harsh: it is home to the second lowest per capita income in the country ($3,700 annually in Shannon County) and a staggering 80% unemployment rate. Residents of Pine Ridge suffer serious chronic illnesses such as diabetes and heart disease at a rate vastly disproportionate to the rest of the nation. The life expectancy for men is 48 years; women on Pine Ridge can expect to live to 52. The school drop-out rate is 50%, and the teen suicide rate is 150% that of the national average. In the midst of the suffering at Pine Ridge is a brilliant light: the Lakota Waldorf School. Waldorf is a humanistic model of education founded by theosophist/anthroposophist Rudolf Steiner in 1919. Broadly speaking, the Waldorf model seeks to develop free, morally responsible, and integrated individuals equipped with a high degree of social competence. 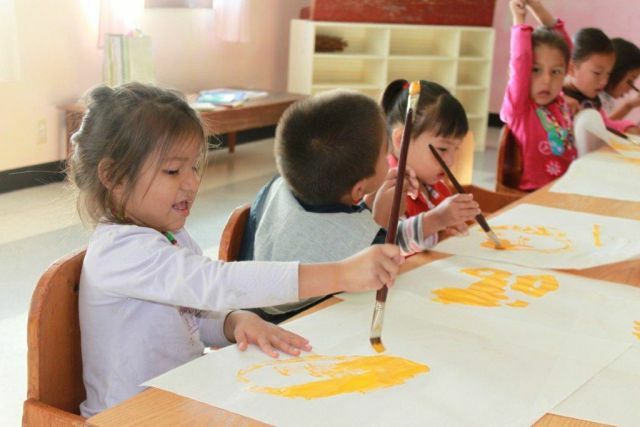 Early years in a Waldorf school focus on practical, hands-on activities that encourage creative play and social skills. Individual schools have a great deal of autonomy, and the Lakota Waldorf educators use this freedom in a unique way. Tribal elders worry that knowledge of traditional Lakota ways is gradually disappearing. There are very few speakers of traditional Lakota language left in the world. Therefore, classes are held in the traditional Lakota language so that children are fully immersed in their language and culture. Presently the school offers kindergarten and first grade classes. Pine Ridge families are not asked to pay tuition. The Lakota Waldorf School operates entirely on donations and receives no governmental or tribal funding. TOS groups in the United States are encouraged to help ensure a solid future for the school and a brighter future for the Lakota people by sending items from the school’s wish list. Another fun way to help is to donate books to the school.